Thanks to the TCJA, 100% first-year bonus depreciation is available for qualified new and usedproperty that’s acquired and placed in service in calendar year 2018. That means your business might be able to write off the entire cost of some (or all) of your 2018 asset additions on this year’s return. Also, be aware that moves designed to reduce this year’s taxable income (such as postponing revenue or accelerating expenses) can inadvertently reduce your QBI deduction. Work with your tax pro to anticipate any adverse side effects of other tax planning strategies and optimize your results on this year’s return. However, you must hold the shares for more than five years to benefit from this break. Be aware that it’s not available to QSBC stock that’s owned by a C corporation. Plus, many companies won’t meet the definition of a QSBC in the first place. Your tax professional can help explain the details. On the other hand, this year’s tax planning is complicated by all the tax law changes that take effect for tax years starting in 2018. 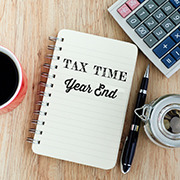 Work with your tax pro to identify the best year-end strategies for your specific business situation.